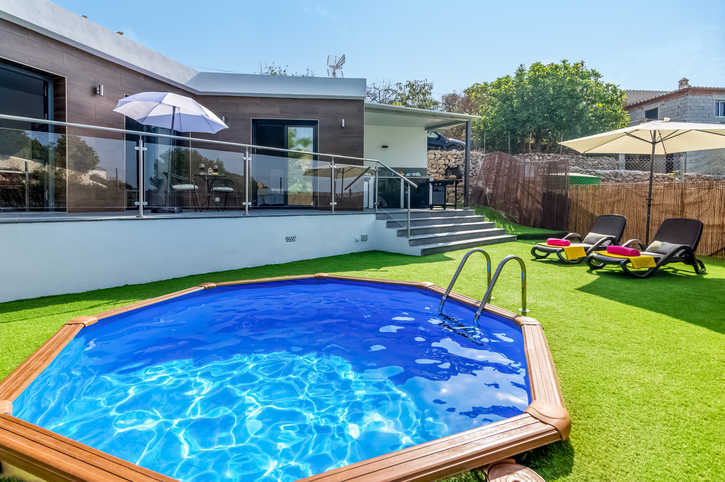 Villa Balcon Canada is a stylish 1 bedroom bungalow style villa set in a picturesque countryside between the village of Frigiliana and the coastal resort of Nerja. Both villages have plenty of places to eat and drink, as well as a number of great beaches all within a 10 minutes' drive. Back at this contemporary villa, relax in your very own private pool or fire up the BBQ and make the most of those sunny days. WiFi and air conditioning/heating in the bedroom are included. A picturesque countryside setting, less than 10 minutes' drive from Frigiliana and Nerja plus 3 beaches! Perfect couples retreat! Gated access to the villa is from the parking area behind the villa. There's a pathway leading you down steps and through a gate at the side of the house to the raised terrace, where the front door is located. The contemporary living area is completely open plan, incorporating the lounge, kitchen and dining area. The lounge area is furnished with a sofa facing the flat screen TV and dining table with chairs in the kitchen area. There are 2 patio doors which lead out to the terrace and pool area, so that a much needed cool drink is at arm's reach. The villa is fresh and bright inside with a relaxed ambience. The villa has 1 double bedroom with an en suite shower room. There are also patio doors leading out to the terrace and pool area, ideal for that morning coffee relaxing in bed and soaking up that Spanish sun. This villa is registered and licenced by the Junta de Andalucia to comply with local legislation on holiday rentals. This number is: VTAR/MA/00210. Villa Balcon Canada offers a tranquil and romantic escape nestled midway between the resorts of Nerja and Frigiliana. Choose between the bustling centre of Nerja with an array of restaurants, beachside bars, or traditional Frigiliana with its cobbled streets and Andalusian floral balconies. The beaches in and around Nerja, plus many places to eat and drink are 10 minutes away by car. There is a mini market and a supermarket for holiday supplies less than 5 minutes' drive away. At night in summer, there are street markets in Nerja selling handicrafts including ceramics which the area is famed for. In both Nerja and Frigiliana you will discover many local shops selling unique clothes and leather goods. The winding streets of Frigiliana offer picturesque sunny restaurant terraces, hanging baskets and cobbled streets. Whilst Nerja town provides the visitor with a vast selection of cafes and restaurants to sample from beach bars to international options. There is also plenty of nightlife available, mostly concentrated in the Plaza Tutti Frutti and the Calle Antonio Millon areas where you can dance the evening away. The nearest beaches are in Nerja and one of the most popular in the area is the Burriana with a range of water sports and activities going on. Along the Burriana Promenade you can enjoy a long stroll with a choice of activities on the way. There is the Carabeo stretch of beaches which is more central to town, consisting of several coves, some of which are accessed by long flights of steps. You'll find smaller beaches and coves along the coastal road between Torrox Costa and Nerja. There are many activities for all the family including an amusement park and sea life centre along the coastline - a great way to entertain all the everyone. Closer to the villa, there is a bird park and two waterparks, Aquavelis which is a 20 minutes' drive away and Aqualand which is around an hour's drive away past the resort of Malaga, with plentiful attractions for all ages. The Nerja Caves are very popular and just a short drive away or you can take the open topped train. Further afield, a must see in Andalucia is the Alhambra Palace in Granada - one of Spain's most significant and beautiful historical sites. On your way, you can pass through the typical and charming white villages of the Alpujarras. Malaga city also has a lot to offer, museums, a port and a castle make it a great day out. Opportunities for golf are plentiful in Andalucia, and short drive away from the villa is Baviera Golf Course with driving range. Between the resorts of Nerja and Frigiliana there are many walks to enjoy and local guides can be obtained. Walking along the River Chillar is great fun in summer with a cooling splash in the water and plenty of wildlife to see. Take a look here at the Andalucia villas that are currently on sale. Villa Balcon De Canada is not available to book for season as it is sold out. Take a look here at the Andalucia villas that are currently on sale. The wonderful Caves of Nerja in Maro Village are one of the most popular tourist attractions in the area. They are set in the slopes of the Sierra Almijara mountains and stretch for over 3 miles. Paintings over 20,000 years old, along with stalactites, can be found, whilst classical concerts are held here in the summer. Aquavelis is the nearest water park to Nerja, located just a 15 minutes drive by car, in Torre del Mar. This park offers all the great rides typical of all water parks, ranging from the intrepid Kamikaze feature, foam ride, river rapids and the twister to the Mini park for the smaller members of the family. Complete with parking, changing rooms and restaurants to choose from, this is a great choice for a day out for all the family. Aquavelis is located in Urb. El Tomillar, Torre del Mar.